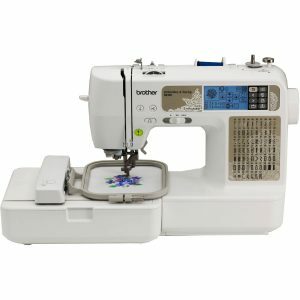 If you are looking for combined sewing and embroidery machine, you have probably come across Brother SE425 Sewing and Embroidery Machine. In this review, I will take a closer look at its features and performance. I will examine what it can do to help you figure out if it is a good choice for you. The end of 20th and beginning of the 21st century revolutionized sewing machine industry. Side by side with the revival of sewing as hobby or business, sewing machines changed a lot. Computers managed to enter every segment of our lives, so it is no miracle that computerized sewing machines were created. Underneath all of the bells and whistles sewing machines still, do the same basic thing – they sew. But, they have irreversibly changed. Modern sewing machines have made an important breakthrough. They became more affordable and more approachable. While it still takes time to become an expert, grasping the basics have never been easier. Modern machines allow beginners to reach a solid level quite quickly. Sewing machines compensate for a lack of experience. Not too long after the first stitches, beginners can take on many different projects. And with the help of new machines, they can execute it quite well. Still, it is not easy to buy the machine that will meet new sewer’s needs the best. Mending, restoring, quilting, embroidering, there are many different priorities to choose. And you can’t have them all. Brother SE 425 is an excellent choice for sewers with some experience, who want to embroider as they grow. So, let’s see what does this machine offer. Brother SE425 has a sleek and fairly modern design. It has an LCD touch screen. The display is black & white though. Nevertheless, it is intuitive and easy to figure out. Sensitivity can be an issue and it takes some time to get used to it. Or, you can use a stylus pen that comes with it. Another small hindrance is the fact that you have to scroll a lot to choose stitches and pattern designs. However, it is impossible to find a simpler solution with such a great number of stitches and designs. Altogether, the goods outweigh the bads by far. Another simple, yet very important detail is the light. A built-in super bright LED light will allow you to sew at all hours and in dark conditions. It is not just bright, but it lits the whole working area. If you have ever used a machine with poor light, you know that your eyes will be very thankful. 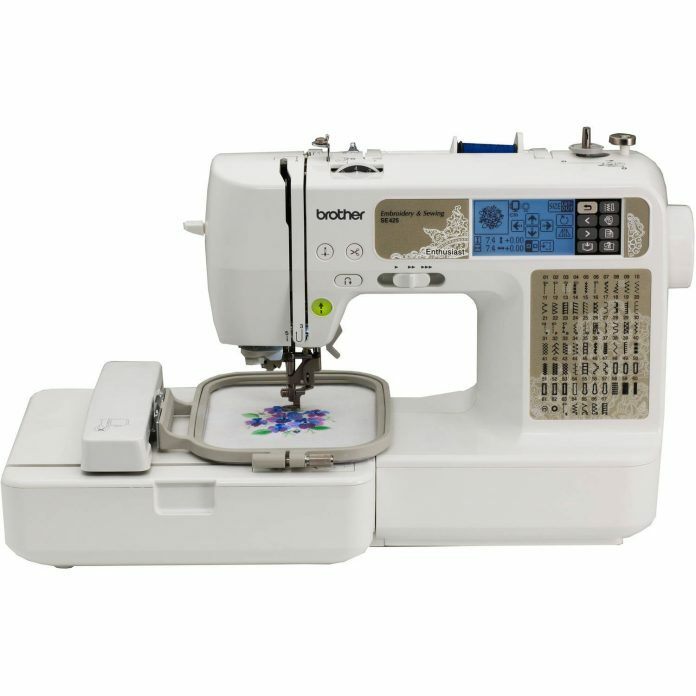 Brother is one of the leading manufacturers of sewing machines. Among other things, their machines are popular because they are relatively easy to use. Brother SE425 is no different. It is packed with high-end features yet user-friendly. But, the first thing that comes to my mind when I look at this machine’s features is versatility. 67 built-in stitches, 4×4 embroidery area, 170 embroidery designs, five lettering fonts, and 120 frame pattern combinations, could you ask for more? 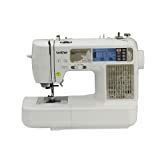 It is really all-in-one sewing machine capable of taking on numerous different projects. There is not enough space to name them all. To be honest you probably won’t use all the stitches anyway. Most of us will use regularly only a couple of them. The rest might be useful for special projects once in a while. When it comes to quality Brother SE425 delivers again. Stitches are sharp, neat and accurate. 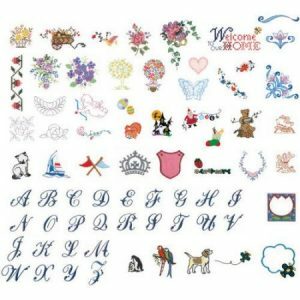 As for embroidery, this machine has 70 built-in embroidery designs, with hundred more on a CD, 5 embroidery fonts and 120 frame pattern combinations. With all of the other features and accessories, it is both easy and fun to embroider on this amazing machine. Embroidery area is 4×4 inches. Some people will find this size limiting. However, you can fix this by purchasing larger hoop. Another way to go around this limitation is by repositioning the hoop. This way you will be able to create larger patterns and move your fabric without readjustment inside the hoop. In order to do this, you will have to break down the pattern into multiple pieces within the software. Then you will load them as separate files. So, basically, you will use multiple 4 x 4 patterns to create one large full pattern. Also, this sewing machine comes with a USB port to connect to the computer and import the designs. I will come back to this option a little bit later. Automatic bobbin winding system is easy to use, fast and accurate. The quick-set top drop-in system is much more practical than front loading bobbin. It allows fast and easy replacement. Also, it is designed to be jam resistant. Seven-Point feed dogs provide excellent maneuvering and steady stitching. You will not hate the whole world when your fabric slips away in the last moment, because it won’t happen with this machine! It comes with a drop feed dogs lever for free machine embroidery. We take automatic needle threader for granted. However, it is not good when you get frustrated even before the work has begun. And we have all been there with occasional threading problem or pricking the finger. The one-touch automatic thread cutter is convenient as well. Needle up/down function will allow you to program your needle so that it will always finish exactly where you want it to – either up or down. Free arm is necessary for circular stitching and free motion quilting. Collars, cuffs, sleeves, and trouser legs will give you no problems. Computer connectivity adds almost endless possibilities. While you can design patterns yourself, you can also choose to upload pre-made designs. I always encourage creativity, but using existing patterns will allow you to complete advanced embroidery projects above your current level. And that is always exciting. The first logical step is to connect to iBroidery.com. They offer thousands of different designs for Brother users. You can also look elsewhere to import designs. Just make sure that the files are compatible with your machine. As you can probably guess by now, this sewing machine comes with a lot of different accessories. Besides the machine, you will get a storage bag to protect your machine. This is a small downside. I prefer hard cases or covers, but it is not a deal breaker. I would still buy a hard case because this sewing machine is lightweight and you may move it a lot. There is an accessory compartment for all your additional tools. This way they are at your reach if needed. It is also a good solution to avoid losing or displacing some pieces. A comprehensive manual is at your disposal if you have any dilemmas and uncertainties about operating the machine. You can also check the display. There is a virtual instruction in 9 easy steps integrated into the machine’s memory. Furthermore, there is a full instruction CD so you can choose the way that suits you best. I have already mentioned 4” x 4” embroidery area. When it comes to embroidery accessories besides the hoop you will get embroidery bobbin thread and embroidery arm. Inside the accessory bag, you will also find extra spool pin, scissors and felt with stabilizer. Moreover, there are three bobbins, seam ripper, a cleaning brush, a screwdriver, a needle set, stylus pen for touch screen and three spool caps. Finally, we come to the most important accessories – presser feet. There are 8 sewing feet: zipper, zig zag, overcasting, buttonhole, embroidery, button fitting, free motion monogramming, and blind stitch. They are snap-on and easy to change. It is hard to choose the major pros because this machine has so many of them. The truth is that this machine has exceeded my expectations and enchanted me! Anyhow, here are some of the good sides of the machine. The versatility of this machine is unmatched, well at least for the price range. When it comes to sewing and embroidery, there is nothing it can’t do. Packed with advanced features, this machine will allow you to let your creative juices flow. With this machine, you will never get bored or stuck with a few lookalike project styles. Combo machines rarely perform well in both fields. They are usually good for one thing, and so-so for the other. Brother SE425 somehow managed to achieve excellence in both sewing and embroidery. With an abundance of stitches and designs, you will be able to take on countless different projects while maintaining a high-quality level. While it comes with many bells and whistles, it is almost surprisingly easy to use. The LCD touch screen is a great help and sort of navigator. Even the absolute beginners will take on some serious projects in no time. Embroidering is a breeze and switching between projects is fast and simple. You can import thousands of designs straight to your machine. This gives you almost a limitless number of options. Light is very bright and it floods the needle and the working area beautifully. You can see exactly what are you doing even in dark and low light conditions. Not to mention reduced eye strain. It is affordable Last but not least, this machine is very affordable. It is not the most affordable one, but given the advanced features and capabilities, it is a great value for the money. This machine, with its performances, can compete with machines that cost at least twice as much. Even though I am very impressed with this machine, there is always room for improvement. I must say that I think that this machine is flawless when it comes to the most important features and capabilities. However, a couple of small issues can be a bother. The 4 x 4 hoop might be small for some projects. As I mentioned it before, there are ways to override this limitation. Still, it is additional work, or cost if you purchase a larger embroidery area. This must come as a bit of surprise. To make things clear, the display is easy to use, intuitive and great to assist you. The downside is not about the function, but about the convenience. We are used to colored screens, so the monochromatic display looks outdated. Choosing stitches can be tedious as you have to scroll and scroll and scroll. The built-in memory is limited. You might need to delete some designs in order to upload new ones. However, the best solution is to keep your designs on your computer or laptop. Then you can import them one by one as you go from project to project. I am absolutely impressed with this machine. Combo machines are a real challenge for manufacturers but this one is a pure success. It is amazing how many good sides this machine has. It has a lot of advanced features, yet it is easy to use and beginner friendly. Sewing performance is excellent, yet it is a fully functional embroidery machine as well. So, it really covers a wide range of projects and it can satisfy sewists with different level of skill. Of course, it is not perfect, but it is the very top of its class. Given that it is an affordable, lightweight machine, easy to use for beginners, it is almost unbelievable how good it performs and how many high-end features it has. To sum it up, Brother SE425 offers versatility, creativity, and functionality at an affordable price.